Order all 9 questionnaires in interactive pdf form (questions can be answered on screen). Includes licence to distribute and use the pdfs across your organization an unlimited number of times. 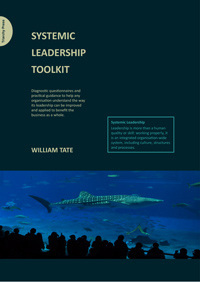 The Toolkit, which is designed to be run as a self-assessment audit in any organisation, has 9 modules - each reflecting one of 9 key themes from The Search for Leadership. The Toolkit and its self-assessment questionnaires are ideal for use by a small team. Team members don't all need to have read The Search for Leadership because there's a short introduction to each theme in the Toolkit - but we really recommend that one member of the team has got to grips with the book. Scroll down to read the full text of Module 8: Leadership and the Shadow, including the introduction, questionnaires and advice. Or, if you're wondering what the Systemic Leadership Toolkit feels like to use, here's a selection of the kind of questions you'll find in each module. They're taken from two different modules (on culture and accountability) and won't make sense on their own. But you get an idea of the kind of topics the self-assessment team will be discussing. How well do these statements describe your organisation? Rate each one on a scale of 0 - 3, where 0 = not at all/untrue and 3 = very well/true. 5.12. There is plenty of scope for managers to be involved in corporate leadership issues that lie beyond their own formal job. 5.15. Your organisation has no ostentatious symbols of hierarchical authority. 5.21. Among your managers there is a stronger feeling of empowerment than of disempowerment. 5.47. Your leadership culture is serving the long-term needs of the business and its internal organisation. 9.4. In your organisation there is an expectation among managers that they will be formally required to account for those things that matter most. 9.13. In your organisation your senior managers' leadership performance is considered separately from their management performance. 9.17. It is clear with whom the main responsibility lies for monitoring and advising on the system's health, design, functioning and improvement. 9.31. Your performance review process includes discussion about the functioning of the system in the wider organisation. Order your copy of the Toolkit here.